I have been a passionate foodie as long as I can remember. After college, with a degree that was not practical enough to lead directly to a job, I was at a crossroad: Cooking School or Law School. I decided on the latter since I can practice law and still enjoy cooking, and couldn't do the reverse (at least not legally). I am that person who spends hours every weekend in the kitchen baking a complicated three-layer cake or trying a new recipe for a French stew, but during the week it just is not practical. I know that time is tight in the evenings after working all day, picking up kids, and then cooking dinner. I have some delicious recipes and techniques that can get dinner on the table in 30-45 minutes, and I am excited to share those with you. Most of my 30 minute meals are not recipes, rather they are guidelines based on your likes and dislikes, what is in season, and what is on hand in your kitchen. November kicks off the time of year where quick and healthy meals are especially important since Thanksgiving, holiday parties, cookies, and alcohol are all too available. That is why eggs are the spotlight this month. They are protein powerhouses, and the yolks are good sources of many vitamins and minerals including Vitamin D and, if they are free range, Omega 3’s. Plus, if you are concerned about eating locally and humanely, eggs are an inexpensive way to do so. Whereas an organic, free range chicken at my farmer’s market might set me back $16, a dozen eggs are only $4. Pair each of these recipes with a salad or side vegetable and some crusty bread, and you have a quick, healthy, and delicious meal! Bon Appetit! Shakshuka is an egg dish that is popular throughout North Africa and the Middle East, including Israel. It is also a favorite in my family. If you look on the internet, you will find hundreds, if not thousands, of recipes. Shakshuka is fundamentally, however, eggs poached in tomato sauce. The great thing about the recipe? From that basic starting point, you can go anywhere you like with it. Add: 1 28 oz can of crushed tomatoes (or san marzano, and you can crush them yourself). Crack eggs into skillet (the number depends on how big your pan is) and cook until the whites are set and the eggs are cooked as you prefer. Make it French: Add herbs like thyme and rosemary, and some white wine to the sauce as it reduces. Before you add the eggs, add in some chopped spinach. Once you’ve added the eggs, dab some goat cheese over the top. Make it Spanish: sauté a little ham or chorizo before you cook the onions (remove from pan and drain excess oil). Add a little smoked paprika and olives to the tomato sauce. Sprinkle the meat over the top after the eggs have cooked. Make it North African: Add in spices like cumin or coriander to the sauce. Add in garbanzo beans before you add the eggs. Make it Tex-mex: Add cumin to the sauce, add black beans before the eggs and sprinkle with a good melting cheese like Chihuahua or Oaxacan cheese. Top with chopped avocado, chopped red onion, and cilantro at the end. A Frittata is basically an Italian Omelet, but baked and not rolled. It is quick and the perfect foil for whatever you have in your refrigerator. I usually use 8 eggs for our family of four, and that’s enough with a big salad or side vegetable and bread and fruit for dessert. 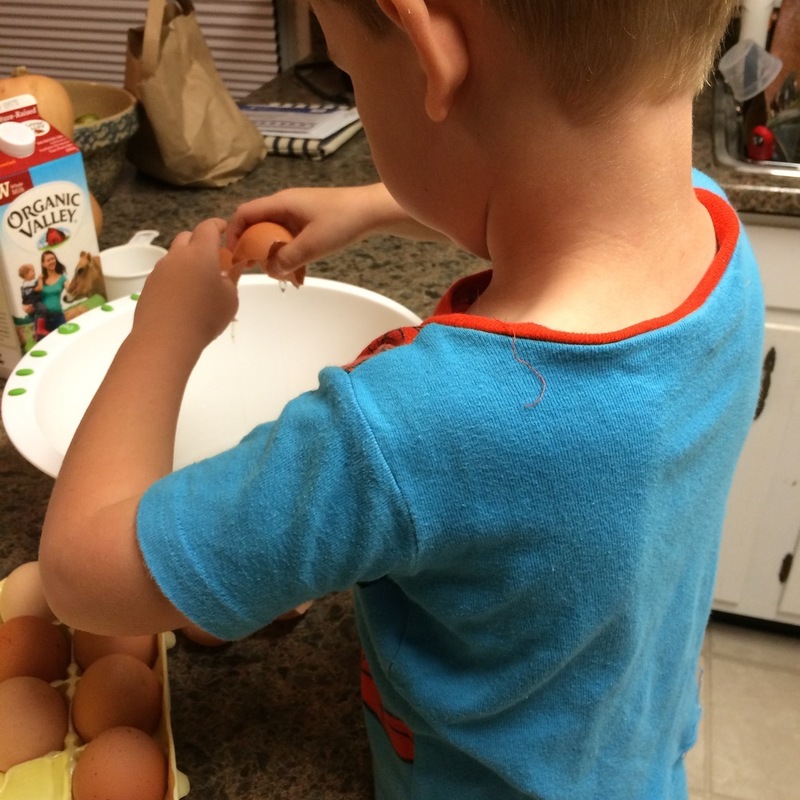 You might need to add additional eggs if you have older kids who eat more. Heat an ovenproof skillet (a well-seasoned cast-iron skillet is my recommendation) over medium heat with a couple of tablespoons of fat (e.g. olive oil or butter). When it is warm add: Finely chopped aromatics (see note below). Sauté until softened, then add: Chopped hard vegetables. Add: Soft vegetables (e.g. greens, or pre-cooked vegetables). Cook until greens are wilted and/or vegetables are warmed through. Put into oven and cook until eggs are set, usually 10-20 minutes. Add bacon, pancetta, or finely chopped chorizo (or vegetarian alternative) before cooking the eggs. You will remove the meat, drain off the excess oil, and add the meat back in before baking. Add in whatever aromatics you prefer: shallots, onion, or leeks! You only need one or two small shallots, one or two medium leeks, or one small-medium onion. If you like, you can slice the onion into little half moons and cook for longer until the onions start to caramelize. I like to do this when I am making a potato frittata. It takes a little longer but is delicious. Chopped hard vegetables: You can use whatever is in season. I have used everything from asparagus to tomatoes to squash. The key, though, is to chop harder vegetables that take longer to cook into very small pieces. Or you can pre-cook them and add later. I usually do not add spices to my frittatas, but I do add herbs. I particularly like thyme and rosemary, but experiment and see what you like! I have used all kinds of greens in my frittatas. I tend to prefer spinach or swiss chard, but kale can make a nice wintery-frittata. Don’t go overboard, though, if you are adding other vegetables. You only want to add a couple of leaves. The greens can overwhelm the dish. For soft or pre-cooked vegetables, use whatever is left in your refrigerator (you could even use leftover pasta!) I will also sometimes pre-roast vegetables like asparagus or very, thinly sliced potatoes, which I cook on 425 until they cook through. For cheese, I have used any kind imaginable, but I definitely prefer cheeses like feta or goat, or just a sprinkling of parmigiano or pecorino. Thinly slice 2 yukon gold potatoes and roast in a single layer on a baking sheet at 425 until some of the pieces begin to crisp and all are cooked through. Cook onions over medium low, covered, with a little salt and rosemary until they begin to caramelize (you don’t have to take them all the way). Right before adding in the eggs, add the potatoes to the pan, add the eggs, then throw it into the oven. Before serving sprinkle with parmigiano cheese. Thinly slice two leeks and cook until soft. Add in a lot of chopped spinach and a little salt, cover and cook until they just begin to wilt, remove cover and let cook over medium-high until a lot of the liquid cooks out, salt and pepper to taste. Add in eggs and feta cheese (this is my take on a spanakopita frittata). Chop asparagus in half cross-wise, and roast at 350 until they begin to soften. Thinly slice a few spring onions, sauté with a little salt and pepper. When the asparagus have roasted, add them to the pan, along with peas (any kind, shelled, or even sugar snaps!). Add eggs and goat cheese.